Location: North 42:12.967, East 009:03.479 (GPS on the summit). Saddle: Col de Vergio, 1478 m.
How to get there: This describes the approach from the west, up the Manganello Valley. There is an alternate route from a trailhead that can be accessed from the village Corte going south west on Hwy. D623. From Ajaccio go north on Hwy D81 to Sagone, or go south on Hwy. D81 from Porto passing through Cargese to Sagone. From Sagone, go north on Hwy. D70 about 12 km towards Vico, make a right in the first traffic circle onto Hwy. D23 towards Guagno. Keep right where the road forks in the village shortly after getting on to D23. Continue about 21 km from the traffic circle to the rather remote village of Guagno. Drive uphill through the village and continue another 4 km beyond the village. The narrow road turns into a dirt road near the end. You will arrive in a left curve where the road forks, there is a sign posted on the left fork. This is the trailhead, there is good parking in this area. The precise location has elevation 1004 meter and location N42:10.568, E008:59.276. Route description: There is an alternative route starting from the bridge Pont de Timozzo on Hwy D623, north of the mountain. This trail heads up the valley directly north of the peak passing lake "del Oriente". This approach is certainly shorter than the route described below. To climb Monte Rotondo along the route given here from the trailhead described above will require a full day (see timing below). From the trailhead, the dirt road forks. The trail starts out along the left fork. There is a sign there for GR20 access and the Refuge de Petra Piana. The dirt road turns the ridge, then descends in very gentle switchbacks part way down the hillside where it ends next to an old (stone) ruin. The map does not show this accurately. From the ruin, locate a rather small trail that heads right (east) more or less horizontally traversing the slope. Do not descend to the river. 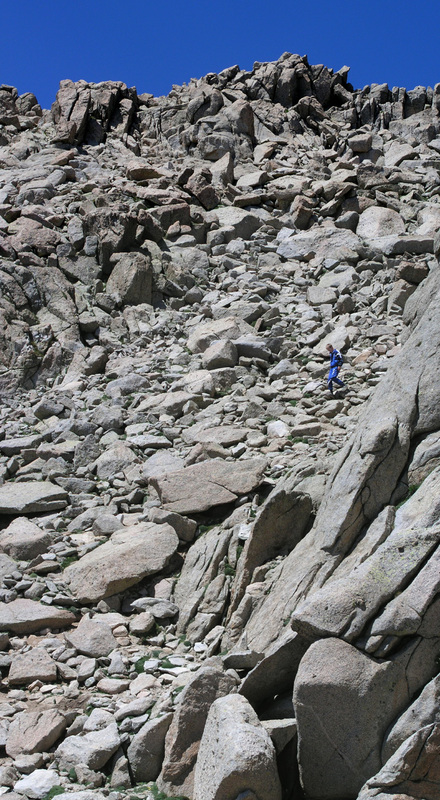 Shortly, this trail merges with a trail that ascends from below and onwards the trail is much better. The trail contines along the slope above the river as it heads up the valley. Gradually, the trail climbs and at the upper part of the valley you pass a fairly large number of stone ruins. In the past, several buildings, today only the walls remain. The trail continues, but somewhat less distinct marked with small cairns. The route crosses few small creeks and runs through (shorter) sections of dense vegetation before crossing a last creek and enter a faily distinct ridge that runs down the slope ahead. This is the end of the valley and the somewhat steeper hill begins. From the top of the initial ridge the trail continues to climb just left of a rock outcrop, then a final slope to the lowest col on the ridge above. There is a sign here, a high ridge variation of the GR20 runs here, while the "official" GR20 route follows the valleys a bit further east on the section south of Refuge de Petra Piana. However, the traverse across from this col to Refuge de Petra Piana that is easily visible from the ridge is more cumbersome than one would expect. You must loose some elevation and the combination of cliffs and rocks with dense vegetation is rather unpleasant. We tried two different variants, none of them very good. There are small cairns almost anywhere, they do not seem very helpful in this area. The refuge Petra Piana is serving the famous GR20 trail and as such you will find lots of people there, many tents and lots of activity. 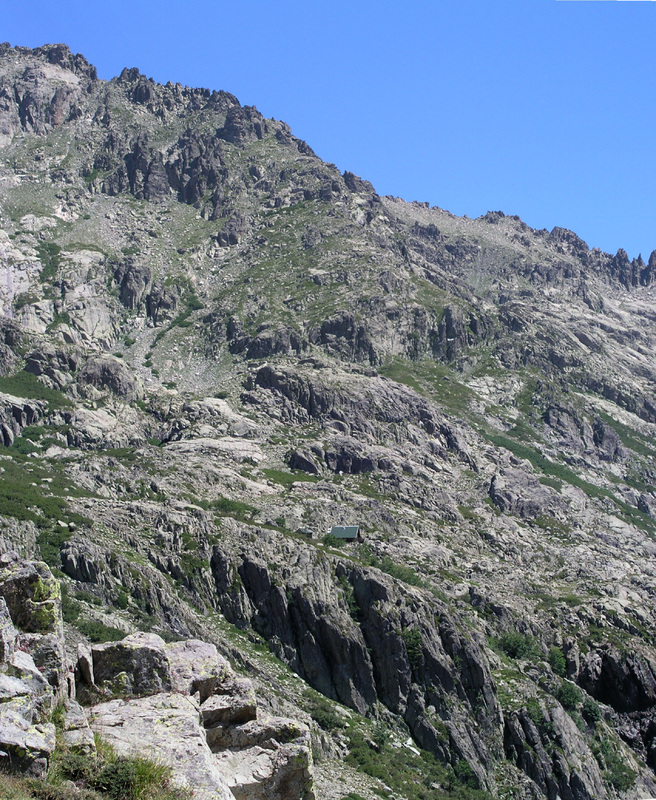 The continued route to Monte Rotondo is not marked on the map, however the trail starts out right next to the smaller building (for the hut keeper) and immediately crosses a small creek. First, head slightly east of north passing a green meadow on your left. Higher up, angle somewhat more east (right) as your objective is to turn just below a ridge that is above you, then climb up along the left side just above the vegetation. A waypoint along this stretch is at 2173 m, N42:12.454, E009:03.732, a small creek runs down here. 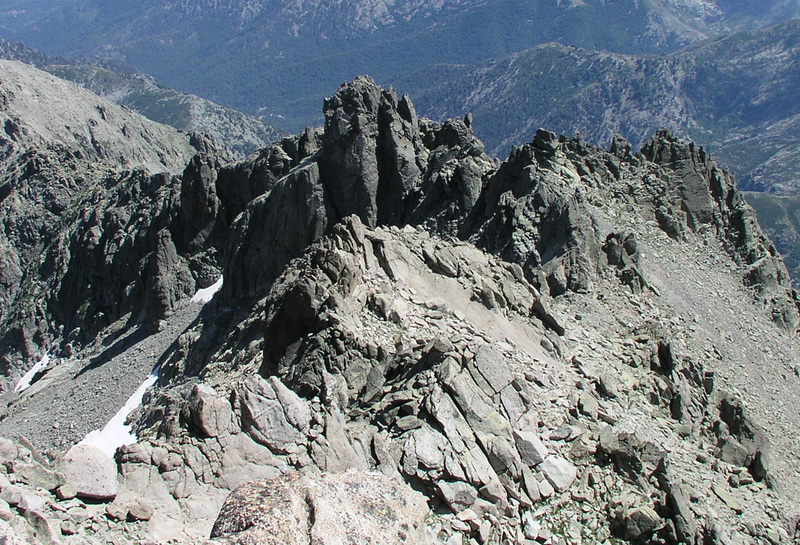 Above you are two small cols, the rightmost has a visible cairn. Do not head up there, rather stay left and ascend the slope there. On top, the terrain is more gentle and a pretty obvious passage continues more gently uphill, there are some small cairns along here. 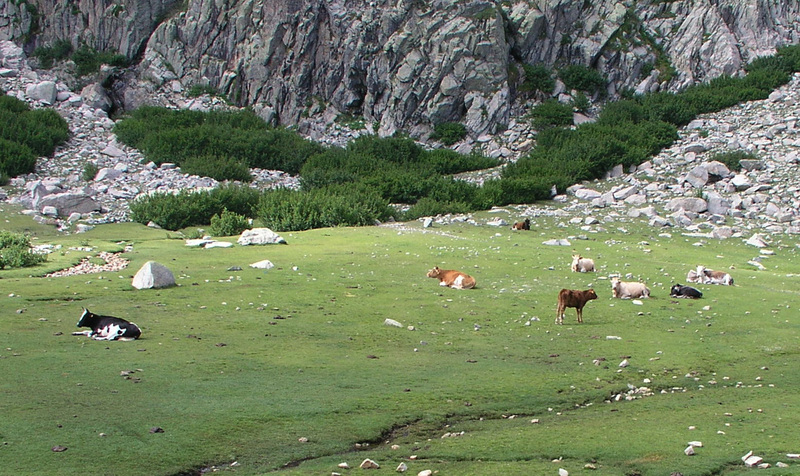 Higher up, the route follows a nice creek as it enters a fairly big, green meadow. This creek comes from lake Bellebone higher up. In order to get there, do not follow the creek, but climb the more gentle slopes further to the right (east). You will pass above another green meadow before you reach the lake. (Both these meadows are shown as smaller lakes on the map.) You are now in a pretty spectacular place. The horseshoe formed mountain with jagged spires all around, a deep blue, quite large lake in the middle. 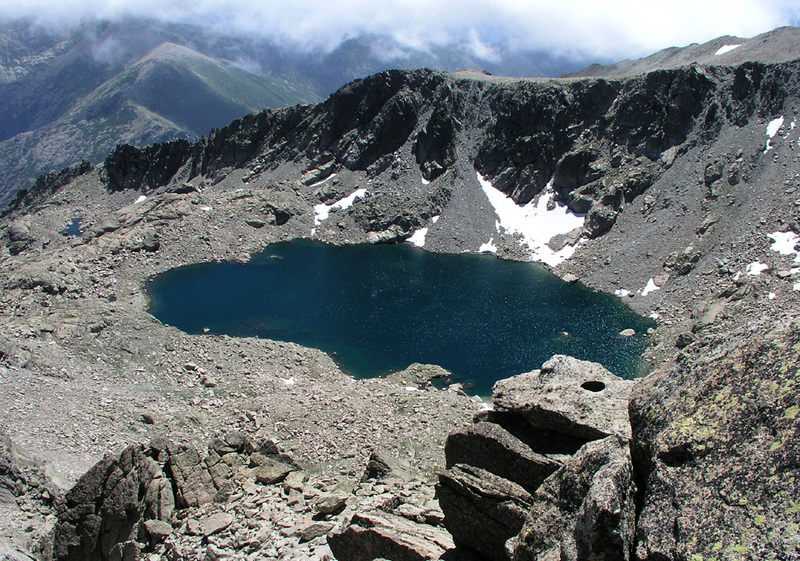 The coordinates of the (outlet) lake are elevation 2339m, N42:12.651, E009:03.432. 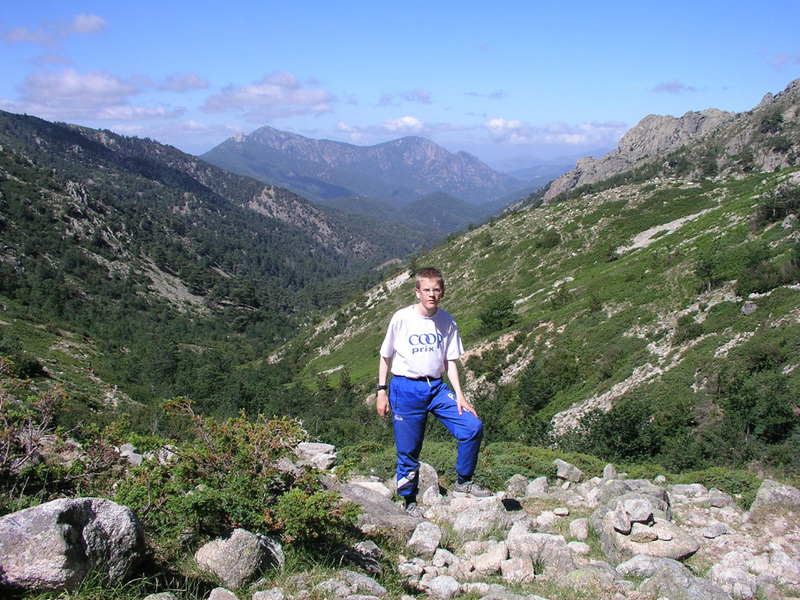 In order to climb Monte Rotondo, continue an ascending traverse east of the lake. 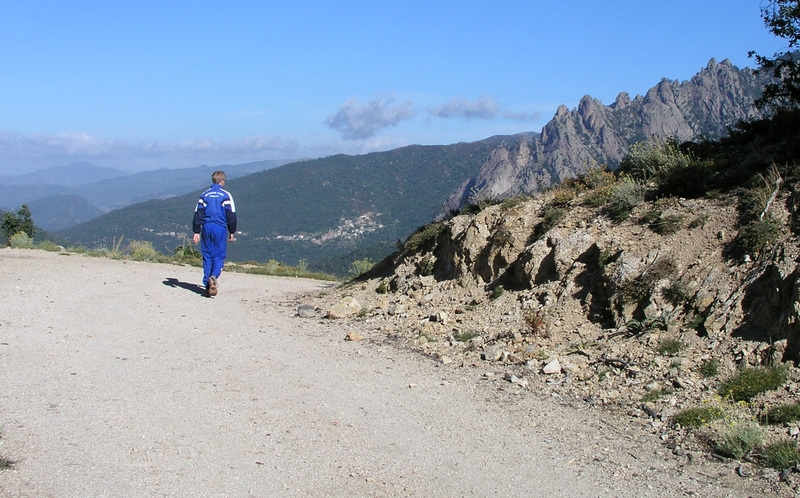 Most cairns and traces of trails seem to ascend to Col du Fen de Lance, this is south of Monte Rotondo. 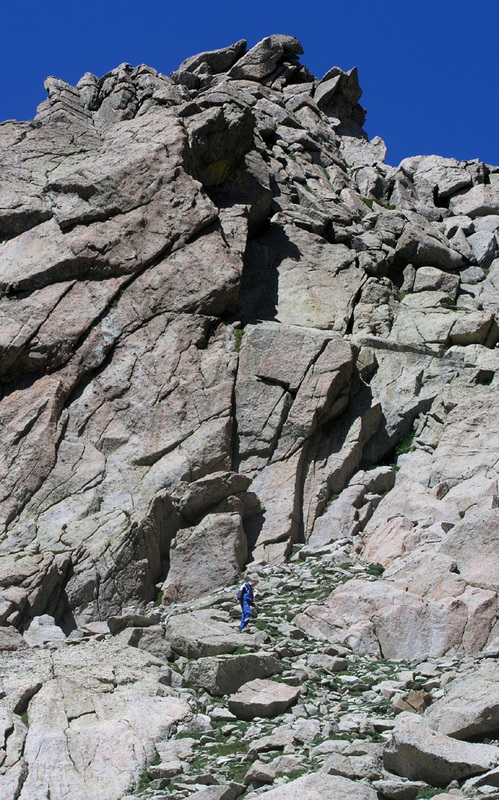 Do not climb to this col, but continue ascending toward the highest point, Monte Rotondo. 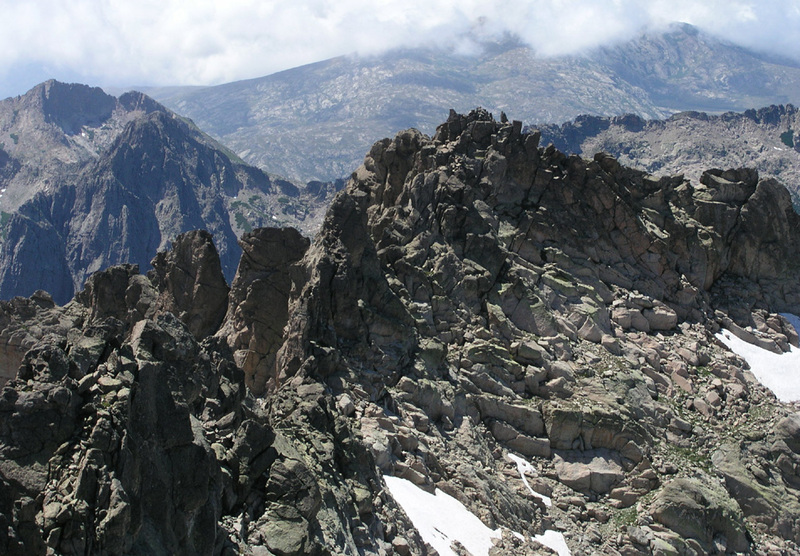 There are many possible variations, all leading north towards the summit. You will arrive at a small summit col with a fairly well built shelter, the highest summit is a few meter to your left (west). The ascent along the easiest route requires no climbing, but one would use hands for support and balance along the way (YDS 2+). 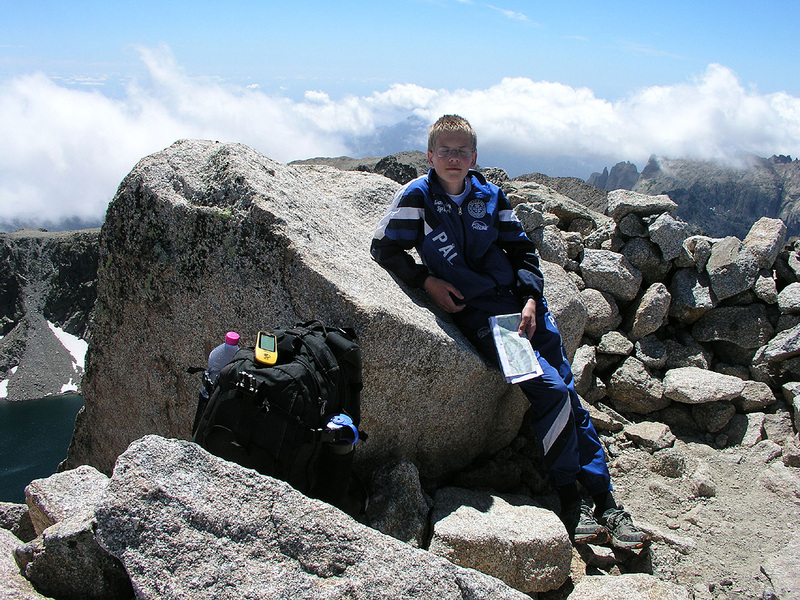 Comments: I did this climb with my son Pål Jørgen, age 16. We left our hotel in Piana (south of Porto) at 0700, the drive took about 1.5 hours and we started hiking at 0845. Having several brief stops along the way, we reached the GR20 trail and the hut Refuge Pietra Piana in about 3 hours and the summit of Monte Rotondo at 1500 after 6:15. We left the summit at 1515, passed the refuge at 1700 and came to the car at 1930. Thus, a very long hike with considerable vertical ascent, we were both quite tired upon return. We made it back to the hotel at 2100, just in time for a late dinner served at 2130. Very few people seem to make this hike. We passed a party while still in the Manganello valley, but they were headed across to the valley further east. Except for the crowd at the Pietra Piana, we did not see any other hikers. The weather was nice with temperatures in the low 20 (Celcius) range until about 1700, towards the end of the day more clouds and a bit of wind. We saw a few isolated, small patches of snow and crossed one such patch near lake Bellebone. M5 continued two days later with Monte Asto. Starting out, this dirt road went downhill. Higher up in the valley. Landscape with Refuge Petra Piana (GR20). Higher on Rotondo, impressive formations. Lake Bellebone below the summit. Summit view north, Paglia Orba and Monte Cinto in the distance. Summit view east, note the summit shelter. 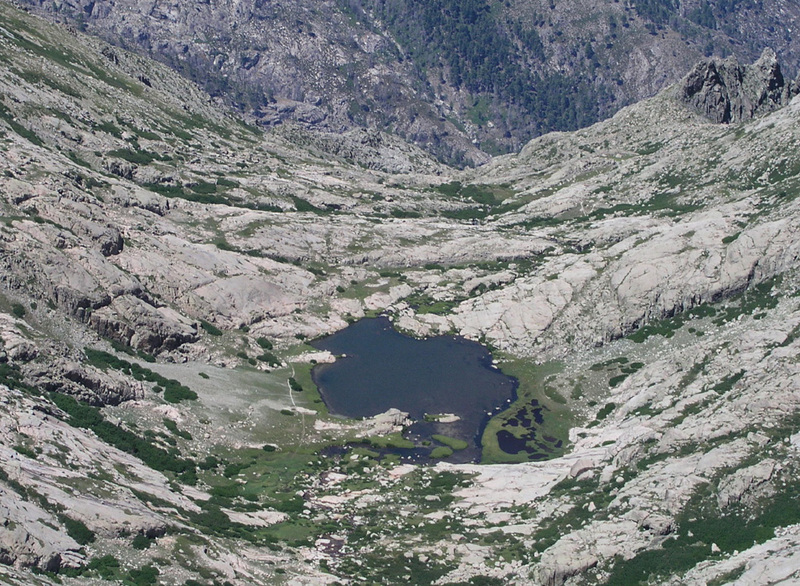 Lake Bellebone seen from the summit. 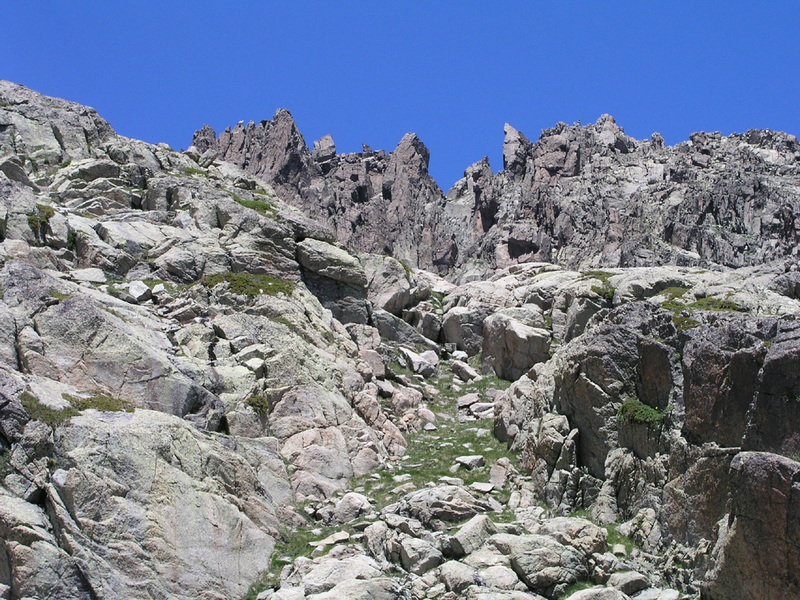 The ridge that continued from the summit. Monte Pozzolo, 2525m, and col du Fer de Lance (that we visited).